Archos has had its hand in the slate game since the early days of "internet media tablets," and while its products don't have quite the same brand recognition as, say, Samsung's, we've found the French company's devices to be some of the best-value tablets available. Budget-minded prices and innovation don't usually go hand in hand, but in the case of its new 101 XS Android 4.0 tablet, Archos has a few tricks up its sleeve. The slate boasts a keyboard cover and kickstand, along with a magnetic hinge allowing the lid to attach to the display. Arriving in November for $400, the Archos 101 XS is a productivity-minded take on slates, complete with a full set of keys and a bundled copy of OfficeSuite Pro. Do the hardware and software add up to a killer combo? Read on to find out. The $400 Archos 101 XS includes a keyboard dock built into the tablet's cover, but this innovative feature doesn't amount to a good typing experience. Be the first to review the 101 XS? When we first laid eyes on the 101 XS, we really liked what we saw. Archos' idea to build the keyboard into the tablet's case was a clever one, and it's refreshing that the company presents this productivity tool as an integral part of the device rather than as an optional accessory. 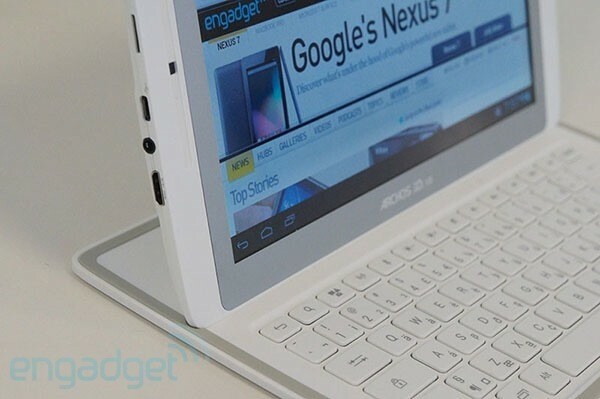 The design reminds us of Zaggmate's iPad keyboard, which similarly locks onto the tablet for added typing functionality. It's refreshing that Archos presents this productivity tool as an integral part of the device. 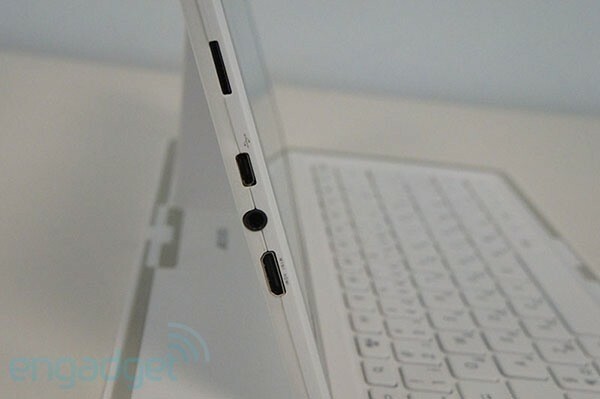 Much of the tablet's body is white plastic, which certainly doesn't lend it a premium feel. In fact, the material picks up smudges almost instantly. The rounded, almost kid-friendly edges aren't the markings of a high-end product either, but Archos tempers the cheap materials with a stainless steel frame that surrounds the 10.1-inch display and carries through to the back of the device. Archos says it used more stainless steel on this device than on previous tablets, and it does feel sturdier than last year's G9. The finish may be stainless, yes, but we noticed a disconcerting number of scratches on the backing, and that was before we even used the tablet away from our desk. 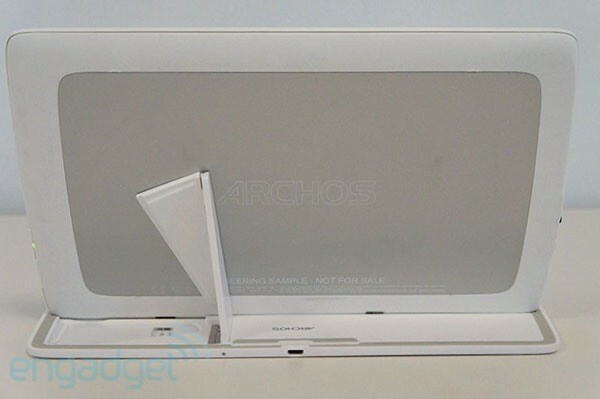 Also decidedly un-high end: Archos didn't hold back with the branding here: the device's name is engraved on the front, while the company's name is stamped across the back. Though the 101 XS' soft lines and plastic body don't provide much eye candy, we must say the device feels very good in the hand. That's the upside to the rounded edges, of course, but for a 1.3-pound, 0.31-inch-thick device, the 101 is reassuringly sturdy (and hefty, we might add). And though we knock the tablet for a slightly chintzy feel, attaching it to the keyboard cover paints a prettier picture. The so-called Coverboard attaches to the tablet magnetically, and the grayish magnetic strip that runs along the edge of the cover matches the silver bezel surrounding the 10.1-inch display. The silver-and-white aesthetic pulls the package together, and the docked tablet even manages to look a little edgy and futuristic. Ports include a proprietary USB 2.0 connector, mini-HDMI and a microSD card slot (compatible with up to 64GB of external memory). Taking a closer look at the keyboard case, we have a chiclet-style layout spanning most of the cover's width, with the docking connector and the kickstand sitting up top. The kickstand consists of two parts that lie flat, but pulling it up to a vertical position lets you prop up the tablet when it's docked in the base. We'll get to display quality in a minute, but it's worth mentioning here that the kickstand tilts the tablet back at an angle that requires you to keep the device pretty distant from your body -- otherwise, you won't have the best view of the screen. The Archos 101 XS has a 1,280 x 800 display, and the absence of IPS technology tells you it's not anything to get excited about. Colors aren't particularly bright, and you'll definitely want to bump up the brightness, as the panel is pretty dark by default. Text and images on web pages aren't especially crisp, but the XS' screen is perfectly adequate for surfing the web and firing off emails. And, come on, when a tablet's priced at $400, we can certainly live without a 1,920 x 1,200 panel. The glossy screen is a glare magnet, but reflections aside, this tablet offers good viewing angles. A keyboard section in a tablet review, eh? The keyboard on the 101 XS is no accessory; it's integral to the slate's design -- as in, it's not an optional accessory that costs more, a la the ASUS Transformer Pad's $150 dock. In addition to upping your productivity, the keyboard cover protects the tablet's screen. It does add a few millimeters of bulk to the 101 XS, though, so the hardware keys are the real value proposition here. In addition to the full QWERTY setup and your standard numbers and arrows, there are keys for all the basic Android functions, including home, back, recently open and shortcuts to the updates bar and apps menu. The keys are so close together that it's easy to hit an adjacent letter, and the buttons are extremely small. 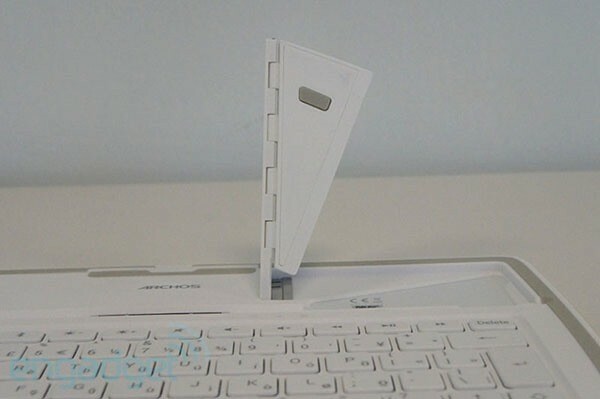 Though we appreciate the all-in-one design, the keyboard dock concept hasn't proved itself to be the most ergonomically sound. Other hybrid devices like the MSI Slider S20 and the ASUS Eee Pad Slider suffer from cramped keyboards, since propping up the tablet takes away so much space on the deck. The 101 XS also has this problem: the recessed island-style keys are tiny and feel squished together. In short, there's a learning curve for typing on the 101 XS. The keys are so close together that it's easy to hit an adjacent letter, and it also doesn't help that the buttons are extremely small. Neither of these issues is a surprise given that the keyboard is built directly into the lid, and while it's ultimately a superior option to the onscreen Android keyboard, it's still no substitute for a full-fledged laptop. We gave an online typing test a whirl to check out our words-per-minute score, and our rate was about 20 points lower than usual, with an increased error percentage, too. We also tried knocking out a few emails in Gmail, and the keyboard evidently did not want those messages to get sent. While typing a few pithy sentences on the cramped layout, we naturally made a few errors and needed to backtrack and correct our work. Pressing the backspace key, though, routinely takes us up to the recipient field in Gmail. Archos says this is a known bug and it's working on a fix with Google. Running a dual-core TI OMAP-4470 processor clocked at 1.5GHz with 1GB of RAM and 16GB of internal storage, the 101 XS isn't crafted to compete with higher-powered (and typically more expensive) Tegra 3 tablets. Still, it performed well in synthetic benchmark tests, outscoring dual-core contenders such as the Samsung Galaxy Tab 2 10.1 and the Acer Iconia Tab A200. Pitting the 101 against the new quad-core Galaxy Note 10.1 shows the limitations of Archos' tablet, though: the Note's AnTuTu score of 11,962 beats the 101's by more than 4,000 points. But it's one thing to benchmark a device and another thing to use it. We didn't encounter many glitches, but the 101 XS just feels sluggish. Cold-booting into Android 4.0.4 took 42 seconds, which isn't super speedy in the scheme of all slates. The Tegra 3-powered Nexus 7, for example, took 35 seconds, and we still think that's too slow. Once the tablet is up and running, though, it performs smoothly. Playing a few rounds of Fruit Ninja, watching YouTube videos and working in OfficeSuite Pro are problem-free. Still, everyday usage highlights the TI-OMAP's modest processing power. We didn't encounter any force-quits throughout our testing, but the 101 XS just feels sluggish. Loading web pages (no matter how strong the WiFi connection), scrolling through the apps menu and our home screens and launching programs takes a few seconds longer than it should. Archos rates the 101 XS' 6,800mAh battery for seven hours of video playback and nine and a half to 10 hours of general use. We ran our video rundown test twice -- once before and once after Archos updated its firmware -- and the average of the two scores was five hours and 36 minutes (the difference between the two tests was about 10 minutes). Most other slates deliver more longevity: in fact, this is one of the shortest runtimes we've seen, falling short of a few older slates, such as the Acer Iconia Tab A100. The 1.3-megapixel, 720p webcam on the Archos 101 XS delivers blurry images during video chats. When we rang one friend up on Skype, he couldn't see our image at all, but our voice came through loud enough. Once we got a decent connection, we both saw blurry, pixelated images. Even with a decent WiFi connection, this tablet isn't a reliable pick for video chatting. Plus, the camera's placement, on the left side of the tablet when you hold it in landscape mode, takes some getting used to: it's precisely the spot where we like to grip the slate, so we had to make an effort to not cover the shooter up with our fingers. Interestingly, though the earlier G9 sported a rear-facing camera, there's only one cam on the 101 XS. The 101 XS comes with Android 4.0, and this build of Ice Cream Sandwich is straightforward and skin-free. However, the device will be upgradeable to Jelly Bean in October. Archos does pre-load a fair share of apps, including OfficeSuite Pro 6, which is clearly meant to be used with the tablet's keyboard cover. There's a remote control app that lets you control other Archos devices on the same network, and the company's Music and Video apps sport an intuitive interface for swiping through albums and movie titles. A Gameloft suite of games, including Asphalt 6 and Spider-Man, is pre-installed, as is a free version of Fruit Ninja. The 101 XS, set to go on sale in mid-September, will retail for $400. The tablet gives you a TI-OMAP CPU, 1GB of RAM, 16GB of internal storage, a 1,280 x 800 display and a 1.3-megapixel camera. That's about all you have for options at the moment, though Archos says it will release 8-inch and 9.7-inch iterations of this tablet by the end of the year. If it's a 10-inch Android tablet you're after, your options are bountiful. A 10-incher for no more than $400? That narrows the playing field, but not by much. The $400 Samsung Galaxy Tab 2 10.1 isn't the most impressive performer (read: it's glitchy), but it gives you nearly nine hours of battery life. It's a bit thicker than the 101 XS (0.41 inches versus 0.31 inches), but it includes similar specs: a dual-core TI chip clocked at 1GHz, 1GB of RAM and 16GB of storage (for the cheapest model). There's also the ASUS Transformer Pad TF300, which costs $379 without the media dock and offers solid Tegra 3 performance. Among mid-range Android tablets, the TF300 is still tops in our book. If you can cross the $400 threshold, devices with higher-res displays enter the mix. The $450 Tegra 3-powered Acer Iconia Tab A700 has a lovely, crisp panel and a comfortable design, though we encountered several performance hiccups. The new iPad, starting at $499, has an amazing 2,048 x 1,536 display, of course, though the Archos 101 XS won't likely be on your list if you need high-end pixel density. Finally, Samsung's new Galaxy Note 10.1, starting at $499 is an interesting alternative, as it offers a different approach to productivity than the 101 XS. Rather than including a keyboard, it bundles the now-famous S Pen for writing, sketching and taking notes, and the tablet is stocked with high-performing handwriting transcribing software. Still, you're stuck with a 1,280 x 800 resolution on the 10-inch display, and we don't think the pen setup is the most practical for work of the essay-writing, PowerPoint-making variety. Sure, we docked the Archos 101 XS for a few key issues -- the uncomfortable keyboard being the primary one -- but you know us: we only gripe because we love. The fact is we got a bit starry-eyed when we first met this tablet. 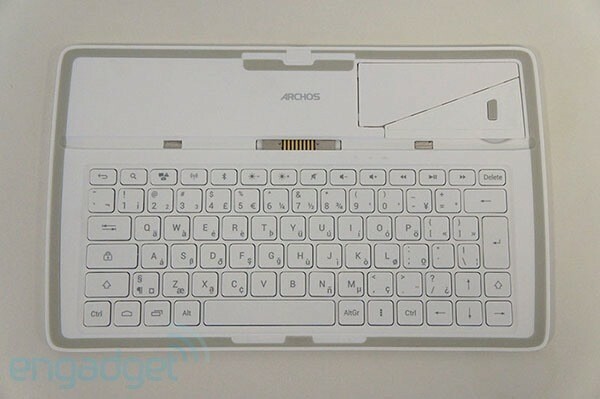 The Coverboard design is smart, even if the plastic feels cheap, and we can't give Archos enough kudos for taking the keyboard beyond accessory status to an important part of the device. 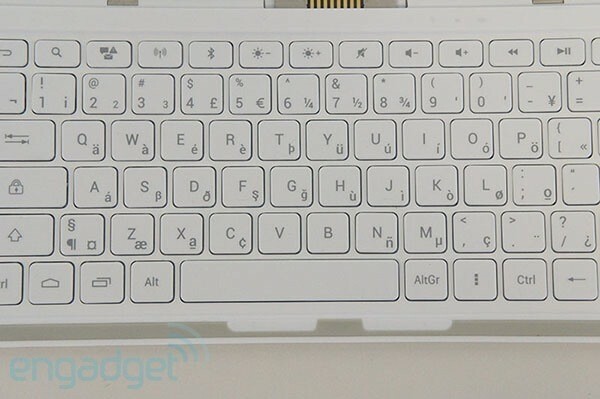 The layout isn't the most ergonomically sound, which defeats the purpose of having a built-in keyboard in the first place, but we hope the company can refine this concept to get better results. Is that an endorsement of any kind? Not exactly. If you have a $400 tablet budget, there's a wealth of smarter choices out there and many comparably priced options provide better performance and a superior display to the 101 XS. For the time being, we'd say if you want a productivity-minded slate, the best option is still to buy a Bluetooth keyboard case.